A scale replica of the Maitreya Buddha statue to be built at Kushinagar, India, before the Maiterya Buddha Kushinagar Project foundation stone laying ceremony, December 2013. Photo by Andy Melnic. The April-June 2014 issue of Mandala is available from the Foundation Store. 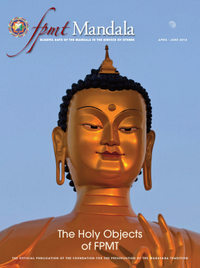 Or become a member of Friends of FPMT at the Foundation level to receive Mandala quarterly.